Urban Restoration Enhancement Corporation (UREC) is accepting applications for the College & Career Ready Initiative’s Pre-Law Institute. 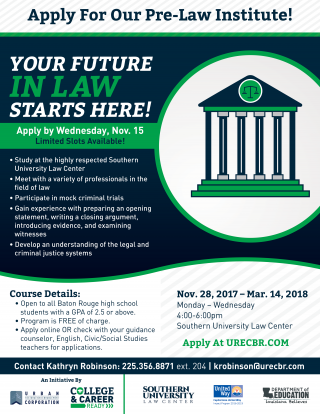 The institute will take place November 28, 2017 through March 14, 2018, Monday through Wednesday from 4:00pm to 6:00pm at Southern University Law Center. The Pre-Law Institute is open to all Baton Rouge High School students with a GPA of 2.5 or higher. The deadline to apply is Wednesday, Nov. 15. Parents of interested students can apply for the program here or via the online application below. There is no cost to participate. College and Career Ready is a 21st Century Community Learning Center providing afterschool and summer learning programs through Urban Restoration Enhancement Corporation and its sponsors. Future institutes for the 2017-2018 academic year will include the: Emergency Medical Responder Institute; and IGNITE Fellowship & Entrepreneurship Institute with a paid internship.